The creation of token holder value and pioneering financial innovation for the blockchain space are both encoded in Nexo’s DNA. In an environment, where less than 13% of ICOs have delivered a live product, according to a recent report by Ernst & Young, Nexo has raised funds ins an SEC-compliant security offering and we have been able to develop a user-friendly crypto lending wallet and a profitable business model in less than six months. Only with Nexo, clients can expect instant crypto loans with no credit checks, as well as SEC-approved custodianship, military-grade security, and an uncompromised user experience. Nexo is the only company in the crypto space to service 45+ fiat currencies in more than 200 jurisdictions. As we rapidly progress with our roadmap, Nexo will continue to unveil amazing features and provide an ever-larger set of possibilities for our clients, partners and investors. Recently, Nexo announced that the First Nexo Dividend will be paid on December 15, 2018. Nexo is a financial institution and currently generates operating revenues from interest on crypto loans. At the same time, in order to develop its strategy, expand its service range and manage its day-to-day agenda, Nexo incurs expenses related to sales, general operations, marketing and administration and pays corporate tax, etc. 70% from the company’s Net Profit will be reinvested back into the company to fund more crypto loans, and a fixed 30% from the Net Profit is paid out as dividend to the eligible NEXO Token holders in the given dividend period. Loyalty Dividend — paid out individually for each NEXO Token based on how long it has been in the Nexo Wallet from one ex-dividend date to the next. The share of the Loyalty Dividend will be no less than 1/3 of the total dividend amount to be distributed in any given period. This approach aims to ensure fairness in the dividend distribution, to prevent fraud, market and price manipulation which are sometimes witnessed with dividend-yielding common stocks around the world. This notion has been around for some time now in the traditional financial world via the introduction of Loyalty Shares (L-shares), described by Columbia University’s Patrick Bolton and Credit Agricole Group, and has been implemented by numerous Wall Street companies. 2. NEXO Token holders must undergo a one-time verification just as they would do at any other compliant financial institution. Nexo’s Know-Your-Customer (KYC) process is very simple, fully automated and usually takes less 2 minutes. Please note that eligible token holders will also receive proportionally the dividends of all ineligible token holders. Opting for the compliant way of an SEC-registered security token offering, Nexo has ongoing requirements to identify its token holders and their eligibility to receive payouts, in line with global KYC/AML/CTF compliance regulations. In the near future, the advancing of the various security token protocols and decentralized KYC compliance standards will allow NEXO Token holders to store their tokens outside of their Nexo Wallets and still be eligible for dividends. Dividends are calculated in USD and paid in your Nexo Wallet in BTC and/or ETH and/or NEXO Tokens and/or USD stable coin, whichever creates greater value for NEXO Token holders at the given moment, which will be decided by Nexo. Should NEXO Tokens be used, they will be acquired by Nexo on exchanges or collected from loan interest repayments using NEXO - as of course no new tokens can be issued, as specified in the audited smart contract. In any case, the ETH/USD and NEXO/USD conversion rates used upon dividend distribution are based on volume-weighted averages across multiple exchanges. 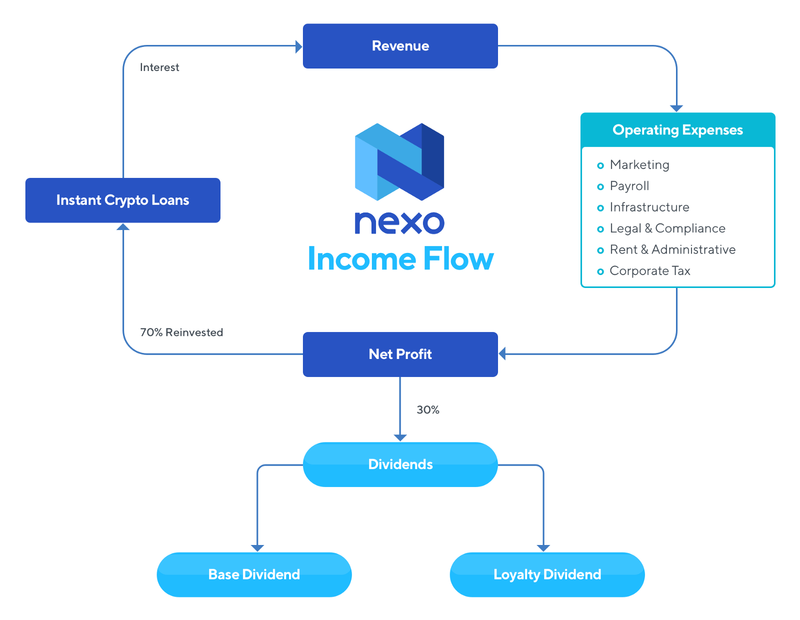 long-term capital gain opportunities from the potential upside of the NEXO Token but also provides them with an instrument with a regular and growing passive income. Disclaimer: Nexo does not provide any tax, legal, accounting or reporting advice. You should always consult your own tax, legal and accounting advisors on related matters.